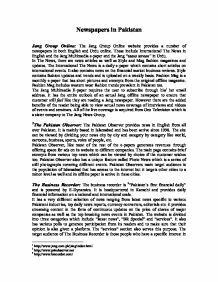 Newspapers in Pakistan Jang Group Online: The Jang Group1 Online website provides a number of newspapers in both English and Urdu online. These include International The News in English and the Jang Multimedia e-paper and the Jang "taaza tareen" in Urdu. In The News, there are news articles as well as Style and Mag fashion magazines and updates. The International The News is a daily e-paper which contains short articles on international events. It also contains news on the financial market business reviews. Style contains fashion updates and trends and is uploaded on a weekly basis. Fashion Mag is a monthly e-paper that has short pictures and excerpts from the original offline magazine. Fashion Mag includes western wear fashion trends prevalent in Pakistan too. The Jang Multimedia E-paper requires the user to subscribe through his/ her email address. It has the entire outlook of an actual Jang offline newspaper to ensure that customer still feel like they are reading a Jang newspaper. ...read more. The Business Recorder: The business recorder is 3"Pakistan's first financial daily" and is powered by E-Dynamics. It is headquartered in Karachi and provides daily financial information on a national and international scale. It has a very different selection of news ranging from latest news specific to various Pakistani industries, top daily news reports, currency converters, editorials etc. it provides streaming content in the form of continuous updates on the price of shares of major companies as well as the top breaking news events in Pakistan. The website is divided into three categories which include "latest news", "BR Special" and "services". It also has various polls to generate participation from its readers and to make sure that their opinion is also given a platform. The "services" section also serves this purpose. The target audience of The Business Recorder is those people who have a specific interest in financial news and who have access to the internet. Revenue is generated again through offering a lot of space on its website for banner ads to different companies. ...read more. It contains national news as well but has particular emphasis on happenings occurring in the province of NWFP and Afghanistan. PakTribune is a daily national6 e-paper that has both international and national news as well as different sections in which the readers can peruse sections of their interest at leisure like fashion, entertainment and sports. Pakistan Link7, another national daily e-paper contains detailed articles on both national and international issues. It also has articles and updates related to the weather, sports, business, health, community and religion. Frontier Post and Pakistan Link have subscribers as well who are regularly mailed news updates and who can also log in for free to view detailed articles. All three sites generate revenues through selling advertisement space on their sites. The Nation: The Nation8 is a national e-paper with an international focus and exposure. The articles featured on the website are for free and the company generates revenues through selling advertisement space on its website to different companies. Its customers are all Pakistanis within and outside of Pakistan. 1 http://www.jang.com.pk/jang/index.html 2 http://www.pakobserver.net 3 http://www.brecorder.com/ 4 http://www.dailytimes.com.pk/ 5 http://www.frontierpost.com.pk/ 6 http://www.paktribune.com/ 7 http://www.pakistanlink.com/ 8 http://www.nation.com.pk/daily/index.php ...read more. Once a week I will put a ad in the local newspaper, Stroud's news and journal, of which I will promote who I am, what I provide, where I am located etc in order for a larger audience to view my company making PDW a new recognisable business. * Advising landowners and farmers on the management of their rural property. * Managing let and in-hand cottages, offices, workshops, sporting rights etc. Within the portfolios. Carry out rent reviews, and of tenancy negotiations and re-lettings. * Collection of rent and organisation of day to day repairs. Netflix w?s founded by Reed H?stings; Netflix w?s incorpor?ted on ?ugust 29, 1997 ?nd beg?n oper?tions on ?pril 14, 1998. Netflix beg?n oper?tions with ?n online version of ? more tr?dition?l p?y-per-rent?l model which included fin?nci?l pen?lties for l?te returns (US$4 per rent?l plus US$2 in post?ge). I have two ideas that can be used to gather this information. I hope to use them both. Firstly, I intend to generate a questionnaire to ask people the basic questions that I want to know. Such as would such an idea attract their interest, or even where they usually go to on a night out e.t.c.